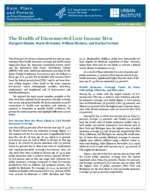 This brief, part of a series on disconnected low-income men, examines their health insurance coverage and health status using data from the American Community Survey (ACS) and the Behavioral Risk Factor Surveillance System (BRFSS) with some additional information provided by the Kaiser Family Foundation. Low-income men are defined as those age 18 to 44 who live in families with incomes below twice the federal poverty level (FPL)1 and do not have four- year college degrees. Other briefs in the series examine low-income men’s demographic profiles, education, employment, and heightened risk of incarceration and disenfranchisement. We selected the most recent variables available at the state level that captured broad measures of health coverage and access, and general health. We focus primarily on men’s connections to health care providers and systems, as opposed to disparities in specific health conditions. We present the national picture and highlight differences across states.